The first mass-market e-readers became available in 2007 with Amazon’s release of the Kindle. In 2009, Barnes and Noble released the first Nook e-reader. And in 2011, Borders Bookstores permanently closed the last of its doors. E-readers are a new technology that combines the old with the obsolete. Personal handheld devices are technologies well integrated into today’s society. With these rising forms of personalized entertainment, book reading has declined immensely. According to a 2004 article written for CBS news, there was a 17 million-person increase in the number of non-reading adults between 1992 and 2002 (Shetty). One could easily argue that the e-reader has revitalized the interest in books by creating a compromise between digital and physical. When the first e-readers were introduced, many were upset by the fact that this device essentially wanted to do away with books made out of ink and paper. Teachers saw them as new ways for students to cheat in class or simply as distractions. Fast-forward four years and my mother is a proud owner of a Barnes and Noble Nook and last semester one of my textbooks was only available as a digital copy. Today’s society has embraced the e-reader as a way of the future. Authors, such as Stephen King, have taken advantage of the system of digital bookstores by publishing eBooks exclusively sold online. Many of these “exclusives” are low priced or come in bundles, bringing in customers with the promise of saving them money. The immense collection of public domain works can be purchased for a single low price on many digital booksellers’ sites. The e-reader has created a new marketplace. In Tom Gunning’s article, Old and New: The General Line from Amazement to Habit, he relates John Onian’s four steps of amazement to technology of today. The cycle can easily be applied to the e-reader. E-readers offer the owner to hold a virtual library literally in their hands. This obviously does away with the physical book, though. However, once people were able to experience the simplicity and the ease of use of the product, e-readers began to catch on. Now they can be seen being carried around just as physical books would be a decade ago. What was initially met with resistance has now been incorporated into society. Are there problems to e-readers? Sure. Physical books are a thing of the past. However, the result is simply the same. Both allow the owner to read. Kozlowski, Michael. “The History of the Barnes and Noble Nook and EBook Ecosystem.” Web log post. 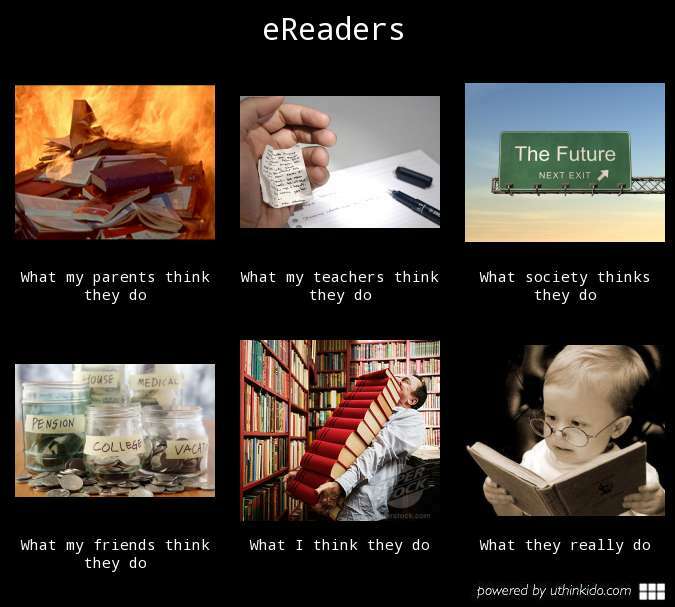 Goodereader.com. N.p., 14 Oct. 2012. Web. 1 Feb. 2014. <http://goodereader.com/blog/electronic-readers/the-history-of-the-barnes-and-noble-nook-and-ebook-ecosystem&gt;. Shetty, Raksha. “Huge Decline in Book Reading.” Cbsnews.com. N.p., 8 July 2004. Web. 2 Feb. 2014. <http://www.cbsnews.com/news/huge-decline-in-book-reading/&gt;.